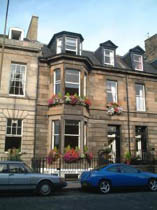 George Warender would be proud of this nicely presented guest house in the Stockbridge area of Edinburgh. The Royal Botanic Gardens are just a five minute stroll over the Water of Leith. The Ardenlee Guest House can be found on a quiet residential street. Edinburgh’s Royal Botanic Gardens are a just a few minutes walk to the rear of the property. The nearby Queen Street Garden makes for a pleasant alternative route to the city centre.